Are you a traveler who just had a baby? Then making family trips with your young one can surely be a hand full. For you to be able to travel comfortably with your little one, you will require a bag that is spacious and has many pockets. We find out the best backpack for traveling moms across India or abroad so that you can organise things better rather than stuffing it. Luckily for you, some companies understand your needs and have gone the extra mile to make traveling easy. The backpacks are what you need and not just for traveling alone, but also for your day to day movements. Having your hands free to push the baby on a stroller and running after your toddler is crucial. The backpack allows you to store all the baby’s accessories without squeezing anything. Bag Nation bag comes with a lifetime warranty, and it is a product that you get to purchase with confidence. It grasps all the vital items for your kid’s care and still leaves room for any additional. You get to strap it on your stroller or carry it on your back with its padded shoulder straps. The manufacturers make it from a Polyester material that is waterproof so no worries when your milk or water spills. Its high-quality non-fraying stitching and robust zippers assure you of its durability. You will make use of the fourteen pockets that are available at your disposal. The sturdy changing mat and a sundry bag is undoubtedly an added advantage to this purchase. The insulated section can only hold one bottle. Cannot position upright when put on the ground. Mancro backpack is your best high quality and pocket-friendly diaper backpack. It has a four point five rating on Amazon. Its primary compartment has a double zipper close that when you open it completely it lies horizontally and you can pack with ease. It has adjustable buckles, padded back and supported straps making it super comfy. The stroller straps and the cushioned changing pad will indeed come in handy to you. As if that is not enough, Mancro diaper bag backpack is manufactured using Polyester material that is water resistant. It is also durable therefore you are sure that it is there to stay. This bag has extra space to fit in your entire tot’s accessories plus your keys, wallet, cellphone to mention a few. The fourteen pockets, two insulated chambers, and a wipes slot are impressive. You will get it in grey and black colors. It is slightly smaller in comparison to other bags. A few concerns in regards to the zipper. If you love fashion, then HaloVa Multi-Function Travel Backpack is your product of choice. It will give you a classy yet trendy look that is outright stylish. It is indeed an easy to wipe clean backpack made from Oxford material that is waterproof. The multi-function bag is durable and has a vast capacity that can hold everything that needs packing for your baby. The insulated pockets keep your buttercup’s bottles either hot or room temperature. You can either carry it as a handbag or backpack, either way; it will make you look sleek. The innovative wet wipe pocket is a saver and the padded shoulder straps that are adjustable to your liking. The zip on the back will enable you to access the bottles and all that you want without having to open from the top. The zipper is at the top and not the front making your items secure and free from anyone trying to pickpocket. There is also the option to hang the diaper backpack on your stroller when taking a walk with your bundle of joy. It is light in weight and comes in ten different colors. Just in case you experience any problem within one year after your purchase the company guarantees you a replacement. The straps are too short making you feel uncomfortable when carrying it on your back. It is not able to fit the eight-ounce bottles in the insulated sub-division. It does not include a changing mat. Just by the look of it, the bag is appealing already. With a rating of four point five in Amazon, the Hap Tim backpack is indeed long-lasting, stylish and practical. It has one main interior compartment where you can see everything from a top view. It has thirteen small pockets and a changing pad that are helpful. The structured top frame is for making it comfortable when carrying on your back with the padded shoulder straps. An insulated section for your tot’s bottles and stroller straps are convenient and versatile. Water-resistant nylon material is superb when you accidentally spill any contents. It comes in grey, dark grey and, gold grey colors. The straps seem not to hold for long. Although the trendy R for Rabbit Oxford Caramello is still new in the market, you might want to consider it. So far it is well received by customers. This Oxford fabric multi-functional bag is strong, durable and water resistant. Big spacing, nine pockets, can fit in a fifteen-inch laptop and a wipes slot that is beneficial. Insulated chamber in the side pockets maintains the inside temperature . The backpack comes with a handy changing mat which helps the mother on the move to change the diapers quickly whenever and wherever. The design is ergonomic and is comfortable, and you will feel cozy when carrying it. 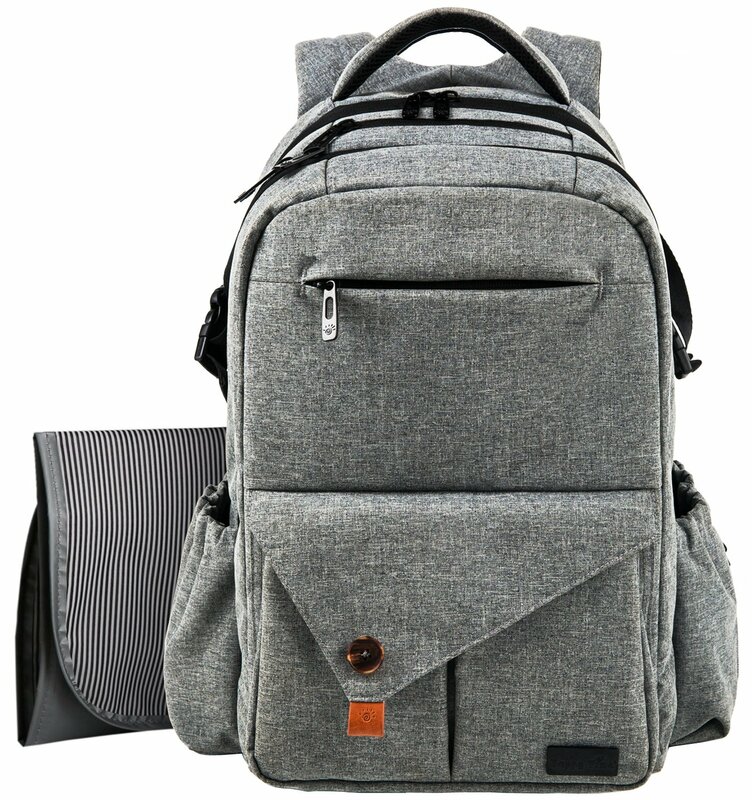 It is fashionable, sleek and a multi-functional since you can use it as a regular backpack. It also stands on its own when placed on the floor. It also has got a hidden pocket at the back. It only comes in two colors. The above best backpack for traveling moms will give you a fair idea of what a backpack looks like. Before acquiring any backpack, you need to have an idea of what you want, have a budget and the benefits that come with the pack. Most of the bags are unisex and make excellent baby shower gifts to parents.